It’s finally the time of year where zombies and ghosts get to come out and rub shoulders with those of us who still have working fleshy bits. Luckily for myself and others who like to live on the spooky side of things, this is also the time we get to see the the biggest release of chilling movies, comics, and video games. Tis’ the season, right? While I’m a pretty big fan of spooky, scary skeletons, it’s no secret that good horror is hard to find these days. One of the reasons may be that horror is one of, if not the most, difficult genre to create in any medium. That’s not to say that the complex world building of science fiction and fantasy is anything short of awe inspiring, or that romance is limited to Fifty Shades of Grey. Horror is just particularly difficult to work with because fear is so unique from person to person, therefore leaving a smaller margin for error. There is a tougher penalty for the movies and television that miss that mark as well, because the scares can be written off as too gory or even comedic. Not to point fingers, but I think modern Hollywood is simply too focused on making top dollar and pulling in sales rather than getting any real scares from the audience, much less actually caring about the story that comes from it. And now I have to share it with you. Like ‘em or hate ‘em, even if you think I’m being a little too critical, Hollywood fails more often than not when it comes to things that go bump in the night. Comic books, on the other hand, seem to have the opposite effect. 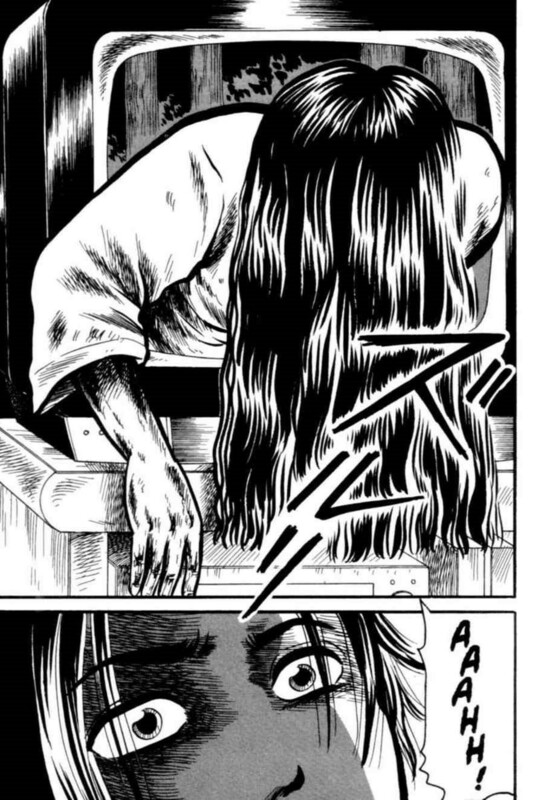 I remember accidentally picking up the “Ring” manga in middle school, and I’ve been trying to get the memory out of my head ever since (pictured left). 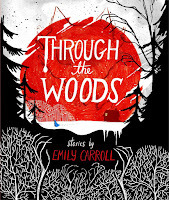 Most recently (and in order to get in the mood for my favorite time of year), I’ve picked up Emily Carroll’s “Through the Woods”, a fairytale-esque hell scape of wonder and terror. Admittedly, I’ve been a fan of Carroll’s ever since stumbling onto her website where she posts the bulk of her work, one of which -- “His Face All Red” -- went viral. 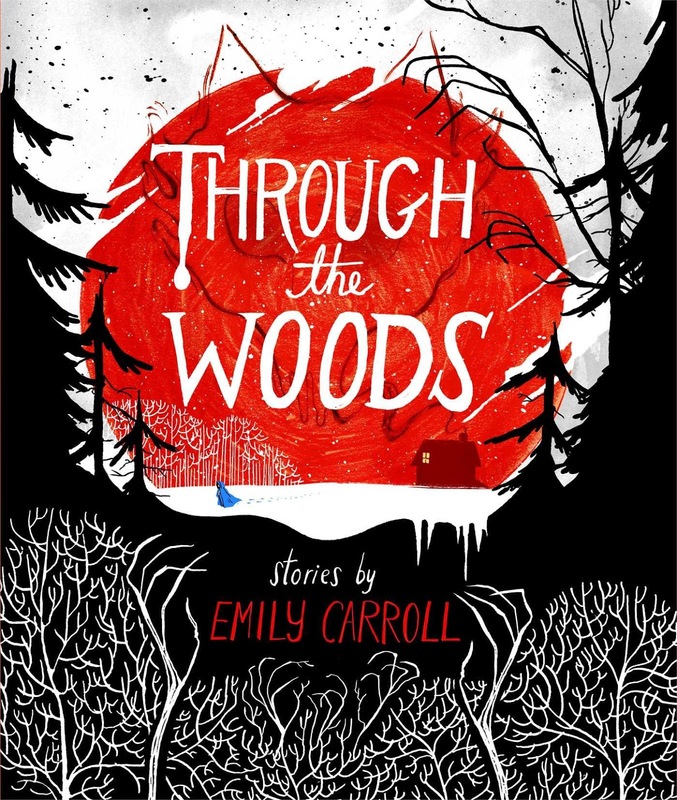 She’s worked on other books before, but this is the only one that is solely Carroll’s work rather than a collaboration with other artists and writers. It contains a collection of five stories, four of which were never released on her website, and each of them is a trip from start to finish. I don’t encounter subtlety in horror very often, but that’s the best way I can describe Carroll’s brand of storytelling. Aside from the astounding art (more on that in a second), it is appealing to read something that isn’t in your face in every scene. 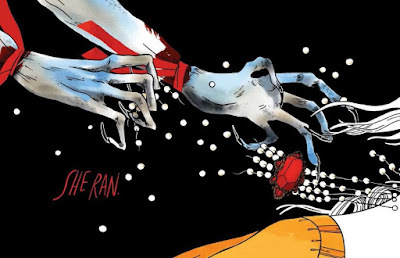 Where something like the “Ring” or Stephen King’s “IT” will bait the reader and then drag them through an onslaught of terror, “Through the Woods” lets you know that there’s a monster under your bed, but does nothing to get rid of it. Carroll relies on the latter fact to seep into your waking mind so it can torture you long after you’ve finished her book. I’ll admit that this may be in part due to the brevity of the stories where there isn’t a lot of room for anything but a quick set up and a conflict, but it’s such a breath of fresh air when everything else is willing to sacrifice quality for attention and longevity. These stories leave the reader guessing at the other half of the tale, and so they’re left to draw their own conclusion based on context. Without a concrete answer, the readers can mold it into whatever they want and are able to torture themselves. This approach is a little different from the more mainstream technique of hinting that the bad guy may be coming back for a round two, because (and I cannot stress this enough) there is no big fight scene in any of these tales. The closest it comes is with “The Nesting Place,” but even then, the confrontation is only a conversation. This being said, it is a comic book and it would be a sin if I didn’t mention how absolutely gorgeous it is. Nothing here is wasted, nearly everything including negative space and color, is used to tell and perpetuate the ambience of the story. One of them in particular, “The Lady With Cold Hands” is especially harsh with its use of primary colors, creating an uncomfortable feeling in the reader right off the bat. While these stories don’t have the advantage of animation that some of Carroll’s online comics do, the composition is dynamic which allows everything to flow and move in a really gorgeous way. The art alone is more than enough reason to justify the price of the book. There’s a lot to unbox here from the perspective of someone who wants to or already creates horror-themed work, but I am not one of them. I will readily admit that I do not have the chops of the Barkers or the Koontzs of the world, but if you're out there reading this, it would be nice to see more of these beautiful horrors. Side note: I am a sucker for new content, so if you disagree with me and want to recommend really cool horror-themed things or if you agree with me and want to recommend really cool horror-themed things, please share in the comments below! Emily Marazzo is a sort-of adult living in Central Texas. She likes butterflies, smartly dressed cannibals, dogs, and getting into trouble with her best friend. You can see what she’s up to on her Twitter if you feel like it.